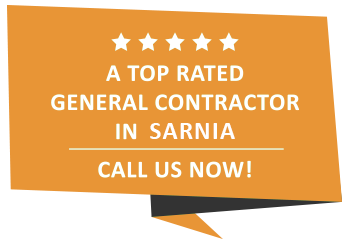 Home Renovations | Sarnia | Carosyl Home Additions Inc.
Year after year, the results come in—Sarnia is one of the best cities in the country to live in, and the real estate market is red hot and shows no signs of cooling. If you’re looking to take advantage of soaring real estate prices, consider the ways that home renovation can add to your home’s value. Interior remodeling is a surefire way to add value to your home in every sense of the word. You’ll be amazed at the way a small facelift can transform the look and feel of your home while making it more desirable for future buyers. And studies show that when you place your trust in quality remodeling companies, you’ll recoup the kitchen remodel cost or bathroom remodel cost you put in when it comes time to sell. Carosyl Home Additions Inc. has been providing top-quality results to Sarnia homeowners for over 35 years. Given our experience and our portfolio, we’re the only choice if you’re looking for a renovation contractor. The size of your home. Renovation costs are determined by the square foot. Larger homes will of course cost more than smaller ones! The area of your home you want to renovate. Usually, Carosyl Home Additions Inc. is contracted for renovation in the basement, the kitchen, or the bathroom, and each has their own costs associated with it. The average bathroom remodel cost tends to be a little lower than the average kitchen remodel cost, as kitchen renovations involve purchasing new appliances as well. Basement renovation is the most expensive typically, as many basements in homes are unfinished and require flooring installation. Any special requirements you may have. The best part of undertaking any home improvement project is the way that you really get to make your home your own. Many of us live in homes that were designed by previous owners and often decades ago. When you specify special improvements to make your and your loved ones’ lives easier, you leave a signature of sorts for future generations. Many homeowners attempt to undertake significant home improvement jobs by themselves in order to try and save a little money. But amateur jobs almost without fail will run behind schedule and over budget. With over 35 years in business, Carosyl Home Additions Inc. is the premier home improvement contractor for our nation’s capital area. We believe in getting the job right the first time, with no unpleasant surprises when the bill comes. That’s why we are committed to giving no-obligation consultations when you contact us over the phone or by email. We’re an expert team with the skills to make any home renovation dream happen with minimal fuss. Let us help you build a new legacy for you and your loved ones today. What are you waiting for? Call us soon!